After a stellar Pilot, can episode 2 of The Flash be just as good? The answer is a resounding yes! And I’ve found a show that will fill the Smallville-sized hole left in my heart. There are a lot of elements of The Flash that are like Smallville season 1 like the meta-human/freak of the week and the doubting hero. But Barry is at least more fun than a brooding Clark Kent. So episode 2 begins with Barry fully embracing being a superhero (which took Clark 8 seasons to finally embrace being one). The Flash is zipping to an apartment fire and beats the fire department and rescues all those trapped inside. However, when Barry speeds away, he starts to feel a bit dizzy. When he returns to Star Labs, Caitlin is not pleased at Barry antics and definitely isn’t happy with Cisco helping him. Before more admonishing can occur, Joe calls him to get Barry down to a crime scene at a gun store. Barry arrives in his Flash costume and has to quickly acquire new clothes at a store nearby. Eddie shows security footage that it was a lone gunman responsible for the robbery. However, when Barry does his assessment, he notes that it was actually six men that could have pulled a robbery like this and all of the men wear the same size 10 shoes. Back at Central City PD (Vancouver filming fun fact: The exterior that acts at the police station is Vancouver’s City Hall), Barry is examining the results when Iris comes in and blames Barry for making her take journalism as a course for her degree. Eddie comes in and is a bit aloof with Iris but Barry tells them they can kiss as he knows about them. The two do kiss and Eddie thanks Barry for being cool about all of this and keeping their secret and says it must be hard to keep a secret. Little does Eddie knows. The real purpose of Iris’ visit is to remind Barry that he promised to go to an event honouring Simon Stagg, a scientists known for his research into organ cloning, with Iris as he will act as a translator for all the science stuff for her article. At this event, Barry tries to explain all the science stuff to Iris but they get interrupted when six gun men arrive set to kill Stagg. When a lone security guard tries to stop them, the six men starts to shoot at the guard but Barry manages to whoosh him away. But Barry collapses on the street outside. When he wakes up, Iris is there and Barry’s excuse is he tried to get the license plate of the getaway car but he fainted. Joe arrives on the scene and is not pleased to see Barry and Iris there. Barry goes to Star Labs and explains that he fainted and Caitlin yells at him for not telling his doctors what has been happening to him. So the team put Barry on a treadmill built for Barry’s speed to see what is wrong with him. As Caitlin and Harrison look at the results, Cisco is thrilled that the treadmill indeed is holding up. Harrison and Caitlin realizes what is wrong with Barry: he is hypoglycemic. 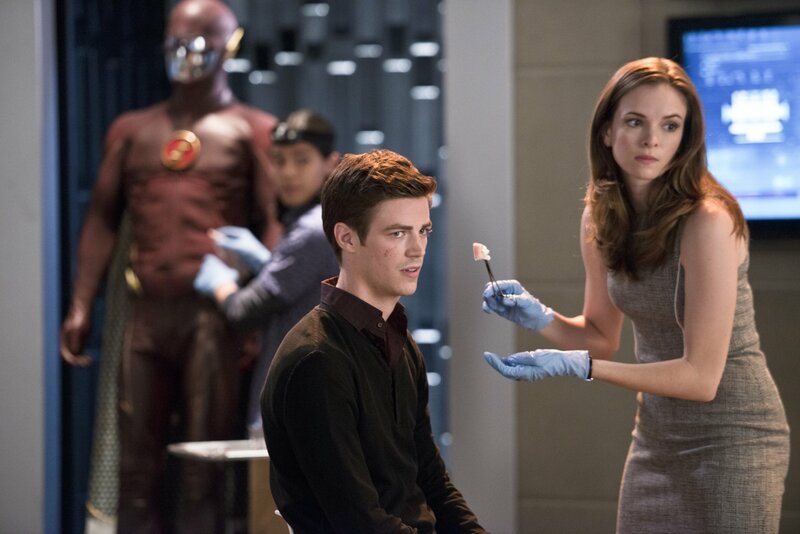 Basically, Caitlin tells Barry that because of his new body, his metabolism has changed and requires way more calories. Cisco says that Barry needs to eat like 835 tacos to keep his energy up. Joe goes looking for Barry at his lab but can’t find him. He however finds Barry’s wall of weird about the impossible and how it could relate to his mom’s murder. Joe also notices a Star Labs sweatshirt and goes to visit Team Flash. Joe is not pleased with Barry trying to be a superhero because while he may be fast, he is not bulletproof. Barry tells Joe that he wants to use his abilities to help people and that he can stop other metahumans out there, that Mardon wasn’t the only one out there. Joe still doesn’t want Barry playing hero and that he is not a cop. Barry yells to Joe that he isn’t his father. Throughout the episode, we see Joe flashback to when he first took custody of Barry and how the young lad kept on running away to see his father in jail. We see young Barry yelling at how Joe isn’t his father and how he hates him. Barry does eventually make it to see his dad in Iron Heights but it is was Barry’s dad who didn’t want to see him and to let Joe take care of him. Later that night, we see Stagg’s head of security meeting with one of the men that tried to kill Stagg. Apparently, the two were working together but the man, Danton Black, still wants to kill Stagg and wants access to him at home. But the security man says no and thinks Black is nothing without his gang. Well we then see Black go all Orphan Black and clones multiples of himself to kill the man. The next day, we see tons of empty donut boxes on his desk when Joe, can’t recall which one, comes in and informs Barry that Stagg’s security guy was killed and found these skin samples on him for Barry to analyze. Iris walks in and notices the tension in the air between her dad and Barry but he dismisses it as work-related. Iris is mad at Barry for standing her up to help her with her story, Barry apologizes and is available to help but Iris says he is too late that she has to find a new story to do. Iris wants to know what is up with Barry and as Iris pours sugar into her coffee, Barry starts zipping around saying that he is real fast now and that he really likes her. But Iris then finishes pouring the sugar in and Barry is back to his spot and is about to say something when the results of the test come in. It shows some cells replicating itself but it seems that it should only come from stem cells/newborns. Eddie and Joe go to see Stagg to inform them that their life is in danger when Danton Black comes in and tries to finish the job. Joe does witness Black multiply himself and before Black can do anything the Flash comes and rescues not only Stagg but also Joe. When the Flash tries to confront Black, his gang starts to beat the crap out of the Flash and then point guns at him and is about to shoot when Barry speeds away. Back at Star Labs, Barry is dismayed that he couldn’t stop Black and is getting discouraged at being a hero. Caitlin used the blood found on Barry’s suit to ID the man as Danton Black, a former Stagg employee where Stagg stole Black’s research then fired him. Barry tells Caitlin, Cisco and Harrison that he has bitten more than he can chew and decides to hang up his Flash suit. At the precinct, Joe tries to convince Stagg to get more protection when Harrison pays a visit. It is clear that Harrison and Stagg know each other and have a history. The purpose of Harrison’s visit is to let Joe know that Barry has decided to stop being the Flash because he doubts himself, because Joe put those doubts in his head. Harrison says that Joe needs to believe in Barry so that he can believe in himself. Barry visits Iris at Jitters, Eddie is there too watching a news report about him being the hero of the day. When he leaves, Iris and he have a talk where Barry says that he has been distracted lately from being the friend he needs to be but that is over now and he is back. Iris then tells Barry that she has found a new story and that she is very much interested in the red streak that has been seen around Central City rescuing people and stopping robberies. This worries Barry but he doesn’t have much time to think about it when he gets a call from Star Labs asking him to get there right away as we see Black there. When Barry arrives, it is just a replica of Black. Caitlin managed to replicate Black and that this replica only acts if the Prime gives it instructions so right now it is doing nothing. Team Flash tells Barry the way to stop Black is to stop the Prime and you will know which one is the Prime by the effort it is exerting to control all the replicas. When the replica starts to move, Joe shoots it dead and Team Flash realize that the Prime is calling his army together. Barry wonders what the CCPD will do but Joe says that this is beyond them that he is the only one that can stop him. Joe’s belief in Barry is enough to get him to suit up. When Barry gets to Stagg Industries, Black is already there and about to kill Stagg when the Flash whooshes him away to safety. Black explains that he wants to kill Stagg because he stole his research just before he was able to replicate a new heart for his wife and now she is dead and he wants revenge. Black replicates himself into thousands and Barry gets overwhelmed as the start to wail on him. Barry starts to doubt but Joe encourages him to find the Prime. Barry does so and knocks Black out. Thinking it is over, Black tries to take down Barry but instead he goes through a window. Barry tries to save him but Black doesn’t want to be saved and falls to his death. Back at Barry’s lab, Joe visits with pizzas in hand. Barry apologizes for calling Joe not his father but says that he has done a job like a father like giving him clothes and food, tucking him at night and seeing him off to college. Joe then vows that the two of them together will find out who killed his mom so they can free Barry’s dad. We then see Barry fully embrace being a hero as Team Flash help him to stop a crim in process. We also see Iris receive a news alert on the Red Streak as her interest gets further peaked. This is so reminiscent of Smallville season 8 when Lois became very interested in uncovering who the Blur was. In the post credit scene, we are back at Stagg Industries and Harrison is paying Stagg a visit. They have a talk about the red streak that rescued Stagg and he tells Harrison that he wants to capture his rescuer as he can believe that he can harness whatever the guy has to help human kind. Harrison tells Stagg that this red streak will be known as the Flash and he rises from his chair much to the surprise of Stagg, and stabs him in the gut saying he needs to keep the Flash safe. So the mystery of Harrison Wells only grows.